Enjoy unmatched mountain scenery right at your door step. Reserve our private hot spring for a warm dip with an excellent view. Bringing in amazing musical performances from Idaho and beyond. Great rooms, suites, private cabins, & RV spots to meet your needs. Grab a delicious homemade meal any time of day at our full-service restaurant. Stay supplied with food, liquor, souvenirs, and more at our full-service grocery store. Get worry-free vehicle service while you enjoy the outdoors, open all year. Come To Mountain Village And Breathe The Mountain Air. What’s Life Like In The Sawtooths? Mountain Village Resort is a beautiful Idaho vacation destination within the Sawtooth National Recreation Area. Stanley, Idaho – home to the resort and a proud population of 63 permanent residents – sits nestled in the beautiful Sawtooth Valley, surrounded by jagged Sawtooth Mountain peaks, green field and forests, and plenty of amazing bodies of water. Set on the banks of the majestic Salmon River – the famous ‘River of No Return’ – Stanley acts as a gateway to thousands of adventures and activities such as rafting, hiking, biking, climbing, making it the perfect destination for outdoor recreation enthusiasts. Mountain Village Resort is perched in the center of it all – at the junction of two scenic by-ways, ID-21 and ID-75, leaving it perfectly situated to ensure you have a great time when visiting our natural, family playground. An excellent stop before any Sawtooth Wilderness escape – our Lodge, Restaurant, Bar/Lounge, Mercantile, and Full Automotive Service Station are sure to have everything you need for a fun Sawtooth Mountain Escape – all in one convenient location. Come To Make Memories. We’ll Take Care Of The Rest. How’s The View In Stanley Today? Picture Refreshed Every 10 Minutes. Press REFRESH Button on Browser to Reload Latest Image. CLICK the image to view the last 10 images. Take a dip in our private, but scenic hot spring. It’s available for reservation to guests! 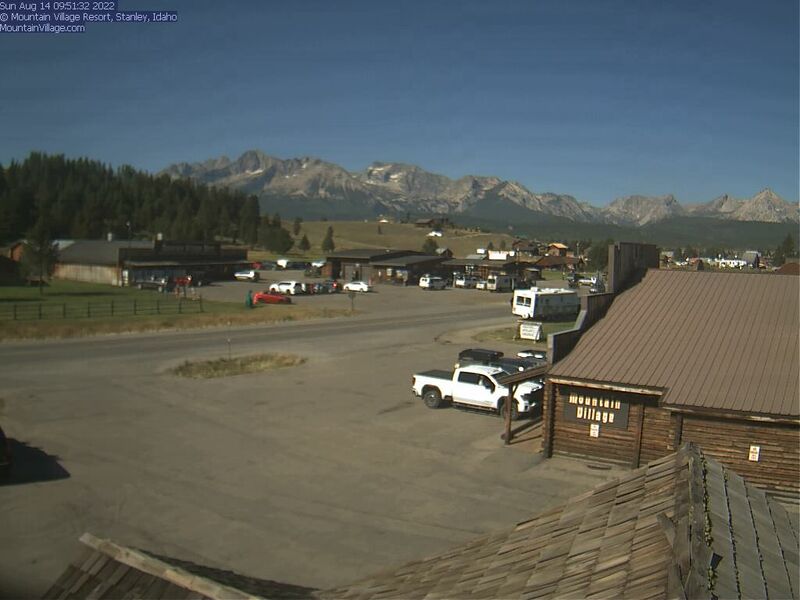 Take a peek at the current view in Stanley, Idaho. Our Live Webcam is updated every 10 minutes! We host live concert events all year long. Grab your dancing shoes and get ready for a good time! Looking For A Private, Secluded Cabin Experience? You need to take a look at our beautiful, Stanley Outpost property. It sits along Valley Creek on the western edge of Stanley and offers a more private, rustic setting to soak in the views and enjoy the peace and quiet of the Sawtooths. With a large, family-sized cabin and a handful of cabinettes (with kitchen furnishings), this is the perfect spot for weddings, reunions, and retreats. Mountain Village is a year round, full-service resort offering a wide variety of amenities and entertainment opportunities. From gasoline and propane to lodge rooms and RV spots, fresh groceries and souvenirs to beer, wine, or liquor, or just a hot, delicious meal and some dancing with a drink in hand – we’ve got you covered on your visit to Sawtooth Country. We’ve got lots of comfortable, pet-friendly rooms and suites available at a great price. Fresh, housemade specials made with love and served with care by our excellent service team. A great place to grab a drink and watch a game, with flat screen TVs, pool table, and lots of fun! You can grab snacks, fuel up, or even get repairs at our full, automotive service station. Buy fresh meat and produce to souvenirs and camping supplies to beer, wine, liquor, and more! Host an event or catch a live performance from an awesome local or national band!